The final three days of the AOM conference were busy but also inspiring. Sunday marked the editorial board meeting of Career Development International and the board meeting of the Career Division executive team, followed in the evening by dinner with the latter team. In between I had several meetings with colleagues I am working with to make some plans for the near future and for upcoming projects. All in all, a day filled with a lot of talking, brainstorming, and coming up with plans for the future. Pretty productive Sunday! Monday was the first “regular” day with symposia and paper presentations. I attended a session about new advancements in generational research first, of which the main conclusion for me was that there are some important advancements in thinking about generations in terms of within generation differences and also that the key characteristics of generational groups differ across countries. A striking example that was provided there, was that the group of people that we call “baby boomers” (named after the boom of babies after WW2) is completely different in Greece, which experienced a massive civil war around that time. As the presenter said: “not exactly a baby boom there because people were killing each other”. Food for thought! Next, I went to a session about gig work (e.g., contract work), which was quite an interesting session that featured some surprising findings about employment contracts of taxi drivers and stand-up comedians. One of the things that really stood out for me was how different employment relations can be for non-standard groups on the labor market, which is an issue I believe needs much more attention in scientific research. In the afternoon, Denise Rousseau delivered her Everett C. Hughes award speech. She won this award last year and shared some of her experiences and wisdom with the audience. It was really interesting to hear how she first came up with the notions of psychological contracts and, later, idiosyncratic deals. A trip down memory lane from one of the most prominent scholars in our field: that was definitely worth the time! One of the most striking things she said was related to the current pressure to publish in A+ journals. Her opinion: your overall storyline in your research, thus the complete idea underlying your projects, is much more important than scoring one or two absolute top publications. In the end, people will pick up on your work if it contributes to a bigger picture, an overarching story that contributes to the scientific and practical debate. Having one or more top publications in there is great of course, yet that storyline is what really counts. I could not agree more, Denise, and thank you for sharing that piece of wisdom with everyone, especially the junior faculty members in attendance. The final activity of the day was the Career Division Business Meeting. It is the annual formal meeting during which all members of our division are welcome to join and hear about the progress we have made in the previous year. This year featured mostly very good news: our membership has gone up again, especially among PhD students, and the quality of submitted work for the conference was good. The PDW (professional development workshop) program was well-attended and also positively evaluated by the participants. Part of the business meeting was also to hand out the awards for Best International Paper, Best Applied Paper, Best Overall Paper, Best Student Paper, and Best Symposium. As a number of committee chairs was not present, I took over for them and provided a brief speech for three of the awards (I had actually been on the committee for Best Symposium, not on the others). It is always a joyous occasion to celebrate the nominated papers and symposiums, and to award these authors with their well-deserved prizes. It also turns out that previous winners of these awards often go on to publish their work in high-profile journals, so winning a Career Division award seems to be a pretty good predictor of later publication success. That is a pretty good reason to submit to CAR! As a final part of the Business Meeting, we thanked Corinne Post for her fantastic work as the division chair of the past year. Her leadership has been absolutely great, and now Bert Schreurs will follow in her footsteps as new division chair. Scott Seibert will be the division chair elect, Jamie Ladge moves on to be the program chair, and Gina Dokko has been voted as our new PDW chair for 2017-2018. Let’s hope for another great year! And then it was already Tuesday, the fifth and final day of the AOM 2017. This was a day that mostly consisted of meetings about current and future projects. AOM is the ideal opportunity to do this, as it is one of the rare occasions where so many people I am working with are at the same place at the same time. Better make that to good use, so I did. Besides those meetings, though, there were two sessions that I did attend: one symposium that I organized myself and a paper session in the afternoon that I chaired. First up was our symposium on sustainable career management of young workers, which I organized with Beatrice van der Heijden and Ans de Vos. This session started in a really special way for me. Last year, I did not attend the AOM conference because my son had been born just two weeks before the conference started. Back then, a picture of me and my newborn son was shown on the big screen on multiple occasions as I had some presentations then and was also involved in the CAR business meeting. People still sometimes come to me and say; “hey, you’re the daddy guy!”. This year, the story was really complete when my son was actually with me during the symposium. It was a very special moment to be in that room, have my slides up, see all the people in attendance, and then have my son in my arms as well. Wow! 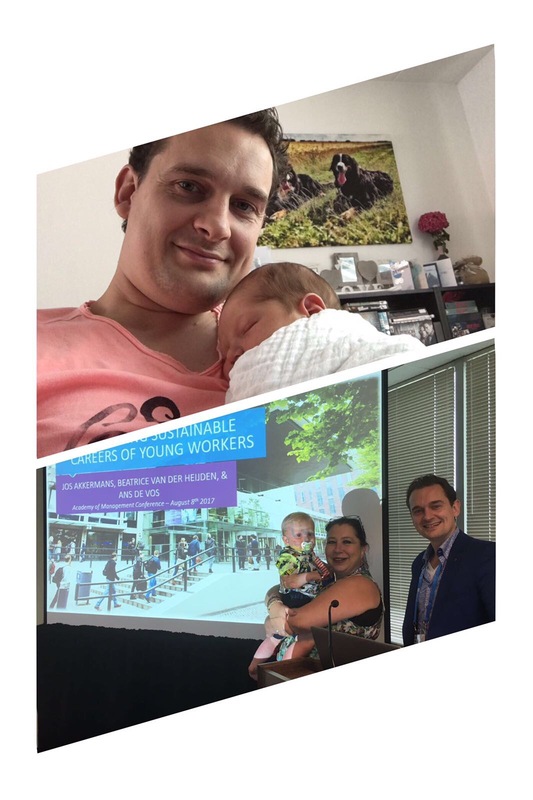 He even attended the first presentation – which I did myself – but I guess he got a little bored of his daddy talking about difficult ‘stuff’ because after some time, he became a bit restless and so my wife decided it was probably best to leave the room. Thankfully, the rest of the symposium was great as well. With some interesting presentations of Svenja Tams, Wolfgang Mayrhofer, Jill Pearson, and Ute-Christine Klehe, followed by a nice discussion led by Joy Schneer, I can safely conclude that our symposium was a big success. Now let’s hope this will provide us with some important new insights into understanding sustainable career management! Last year the upper picture was shown during AOM 2016. This year, Gavin actually attended our session! The very last activity of the AOM conference 2017 was a paper session about career adaptability among students that I chaired. The attendance was not really great but that is what you get on Tuesday at 3 PM. Luckily, the ones who decided to attend were actually really interested in the topic, and I think all the presenters received some great feedback on their work. It makes you wonder what is actually better: having a large room filled with people vs. having a smaller room with a group of about 10 people. In my experience, the former has the advantage of reaching more people but the latter has the advantage of a more in-depth discussion and better feedback. That was the case in this session anyway, and all the presenters made it clear they were very happy with the feedback they received about their work. Hopefully it will help them all to publish their interesting work! If you want to know more about the two presentations I gave during the conference – both on behalf of PhD students I work with – you can check out the Agenda part of my website and click on the sustainable career and career adaptability items. You will find the presentations slides there. If you are interested and would like some more information, you know where to find me. That concludes my AOM 2017 updates and review. It was a great conference again, and it gave me a lot of renewed energy and inspiration. I really look forward to continue with the ongoing projects and also to start up some new work. Among those new projects are a special issue that we will be organizing about contextualizing careers with career shock events, a qualitative study about career shocks among top managers, a potential project about digitalization and its effect on the employer-employee relationship, and a future project about school-to-work transitions of university students in Portugal. Looks like I won’t be getting bored anytime soon!